Guwahati, the largest city in Assam has seen considerable growth over the last few years. The city had over 7 lakh vehicles as of 2014, with this rising at a steady pace. Two-wheelers account for over half of these, with estimates putting them to be around 4 lakh in number. While these numbers might seem on the lower side when compared to other Indian cities, they are accountable for a significant portion of all accidents in Guwahati. It is mandatory for all two-wheelers to be insured in India. A good policy not only offers protection, but also peace of mind when riding in the city. Being the largest city in North-East India, Guwahati is a hub of local business and commerce. As such insurance companies which might not have a base in other towns in the region have established offices here. 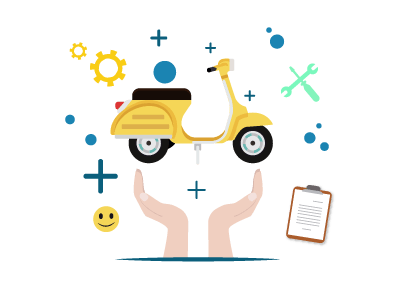 Currently over 30 general insurance companies offer two-wheeler insurance plans in the city, with the popular names listed below. Locating a garage after an accident can be a task. Insurance companies have eliminated the hassle of searching for a garage by offering the services of network garages in Guwahati. These cashless garages help both insurers and customers, with insurers using them to improve their services, thereby retaining customers. Individuals who wish to locate a cashless garage in the city can do so by using any of the options listed below. Search the official website of the insurer to find information on all network garages in a particular area. Contact company representatives on their customer care number and request them to provide a list of all cashless garages in the city. In cases where the policy was purchased through an agent, one can contact him/her to get details about cashless garages. Certain insurance companies provide a list of network garages in their brochure. Certain insurance companies provide a list of network garages on their mobile apps. Quick – Network garages often service the bike/fix the damage quicker than regular garages do. This ensures that one can get on with the purpose for which the vehicle was purchased. Hassle-free – One needn’t negotiate/haggle over price when the damaged vehicle is given for repair. The insurance company handles the communication with the garage. The policyholder is just expected to provide relevant documents before utilising the services of a network garage. Professional – Network garages are often more professional compared to regular garages. One can expect the task to be completed on time. These garages also hire expert mechanics and technicians, ensuring that the problem is diagnosed and solved correctly. Quality parts – Network garages are less likely to use duplicate/cheap spare parts to repair a vehicle. This ensures that there are no complications in the future. Reduced spending - A policyholder might not have to pay a single rupee to get the vehicle fixed at a network garage. The bill is directly settled by the insurer. The only instance where payment might be needed is when the bill amount exceeds the cover limit. Additional services – Network garages offer additional services like doorstep pickup/delivery of bike, towing, roadside assistance, etc. Replacement bike – Certain insurers offer a replacement vehicle while the damaged bike gets fixed at a network garage. A good bike insurance policy can be a boon during an accident. However, there are chances of choosing a policy which offers no real protection. Individuals should consider the following points before they select a policy. Policy term – Insurers offer two-wheeler insurance policies with a term ranging from 1 year to 3 years. Selecting a longer tenure can be beneficial, eliminating the hassles of periodic renewal, in addition to being more affordable. Cover type – Two cover types are popular in the country – Liability-only and Comprehensive. Select a cover based on riding habits, area of use, history of accidents, etc. Premium – Compare policies and find one which offers protection at affordable rates. Do not forget to utilise the NCB (if any) to reduce the premium on an insurance policy. Claims – Choose an insurance company which is known to honour claims. Check the claim settlement ratio before making the final decision. Network garages – Ensure that the insurer has network garages in the area where the bike will be used. Terms and conditions – Check the terms and conditions before purchasing the policy. It is important to read and understand the fine print to know the policy inclusions/exclusions. Individuals who have purchased a used vehicle are expected to get the insurance policy transferred in their name. With the market for used two-wheelers expanding, it is possible to come across bikes which are registered in different states. Failure to transfer the insurance policy can be grounds for rejection of a claim. Transferring the insurance policy is easy, provided one keeps these simple steps in mind. Inform the insurance company once the bike has been sold. Details of the same need to be provided. These include documents like the sales deed, NOC, RC, etc. The buyer is expected to provide his/her details. Any fee (if applicable) should be paid by the buyer. The insurance company will transfer the policy to the buyer once it has verified all documents.